Auckland How many times do we get to travel most of the way around the world? If lucky, as I have been in life and work, sometimes, but it’s still rare, so it was a gift to hear from Mat Danaher that he was now living and, even better, working in New Zealand. I knew Mat from several annual meetings I had with him when he was working in the London headquarters for Unison, the 2ndlargest union in the United Kingdom. He knew I was on vacation, but wondered if I was up for a screening of the THE ORGANIZER and talking about my book, Nuts & Bolts both of which he had been following on Facebook? My answer to his generous offer was not yes, but, heck, yes! 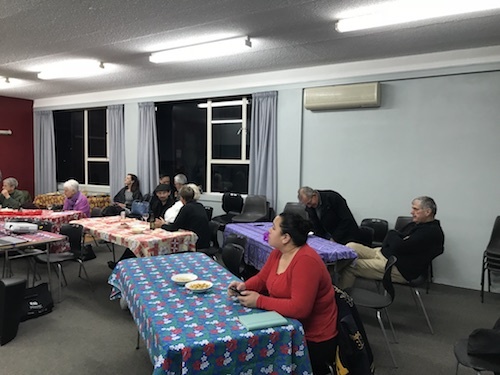 So, we found ourselves trying to figure out parking nearby the Auckland Trades Hall building on a Tuesday night as the wind was almost knocking us off the hillside on what passes for a winter night in New Zealand. All of that was an hour before the scheduled start time for the event, but when we went through the door of the union hall, there were already a half-dozen people scurrying around in preparation. They know what they’re doing in Auckland! 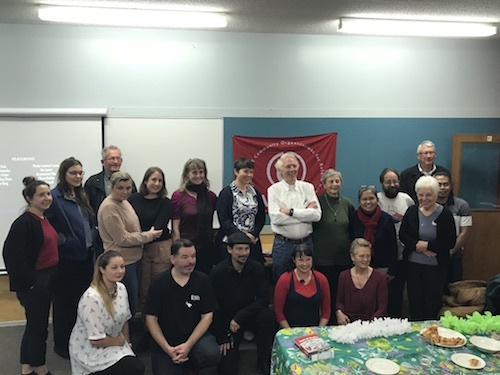 Mat of course was making sure the projector and speakers were set up to the screen and working, but the rest of us got to work setting up tables in a semi-circle which is the preferred method for the unions and the Auckland Labor History group sponsoring the event. It took us a while to figure it out, but it turned out there was a bar and snacks being prepared by the Working Women’s Collective, so that by the time the documentary began showing there were tablecloths on each of the tables and bowls of food everywhere including a “nibbles” table in the back. Ah, now we get it! Not sure that’s the whole explanation for why there were already a score of people there a half-hour before the event? Folks seemed genuinely glad to see each other. They were chatting over a beer or glass of wine, even as they were making apologies for the traffic holding others up that they knew were on the way. The film in fact started with over forty in attendance at five minutes after the scheduled six o’clock time – where does that every happen? It turns out New Zealand is the answer – what great people in a great country. Not surprisingly the crowd warmed to the film, laughing and crying in all of the right places. 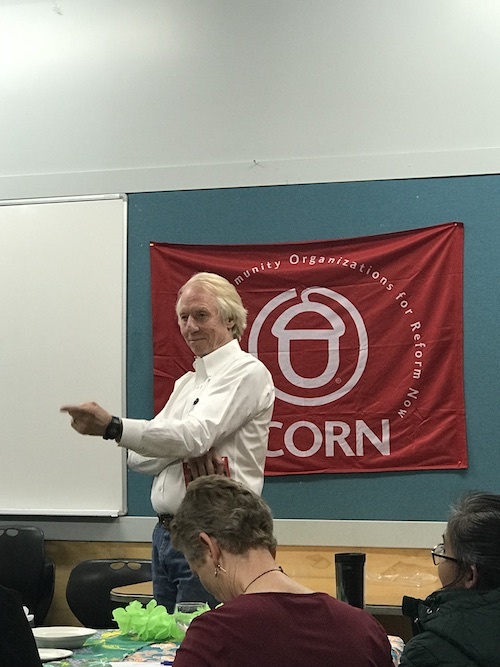 The questions, as expected, were direct and to the point about the impact of media on organizing, the ever-difficult question of expansion versus maintenance, the prospects for the rebranded groups and the potential of ACORN returning in the United States. The unanimous verdict was that the film was inspiring. 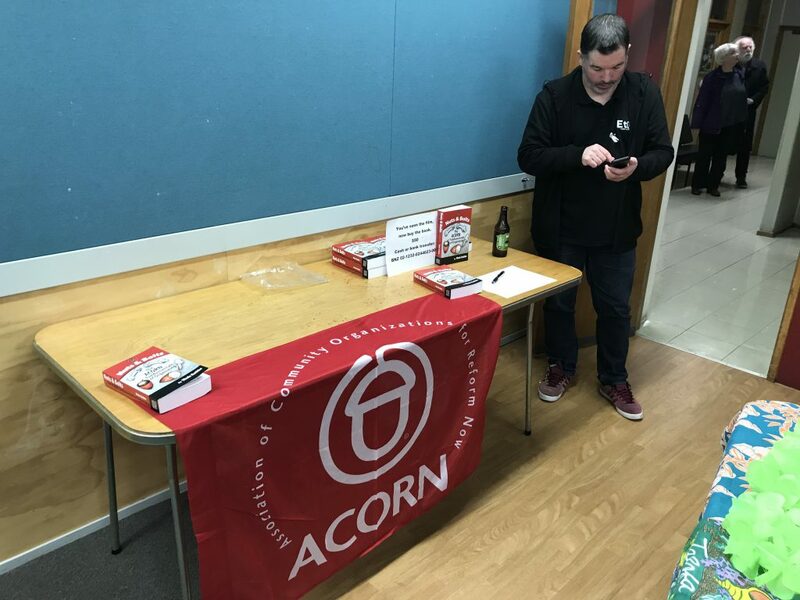 There was also interest in whether or not there might be a place for ACORN in New Zealand, especially given our experiences organizing the ACORN Tenants Union in the United Kingdom. The family consensus, walking back outside hours later into the wind, was straightforward: the film was better, but the people in the audience were wonderful! 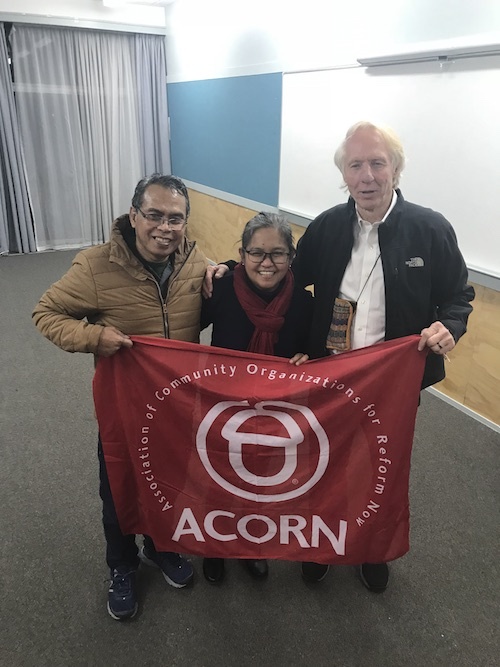 This entry was posted in ACORN, ACORN International and tagged Auckland, New Zealand, The Organizer by Wade. Bookmark the permalink.